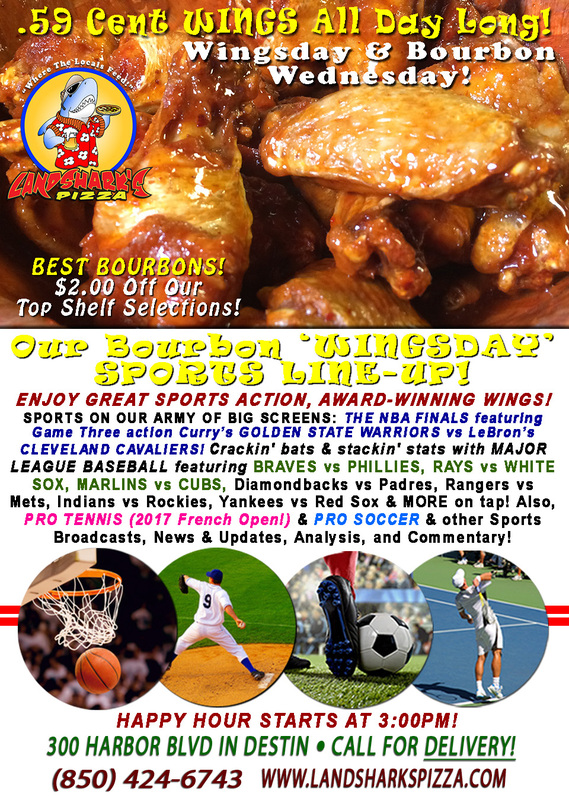 / Best Hot Wings in Destin FL / WINGSDAY NBA FINALS GAME 3 & French Open Wings only .59¢ Ea. 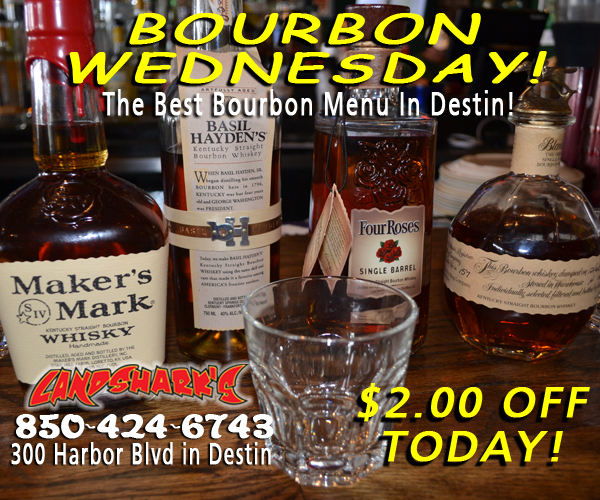 & Best BOURBONS all $2 Bucks Off! 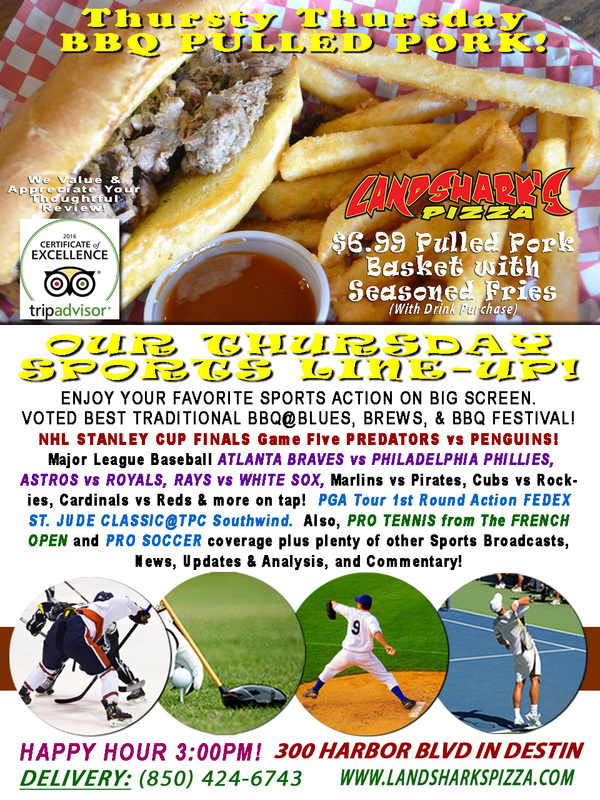 WINGSDAY NBA FINALS GAME 3 & French Open Wings only .59¢ Ea. & Best BOURBONS all $2 Bucks Off! This Destin’s ‘Weekend in the middle of the week’ – the day you stand atop the hump and breathe easier cuz it’s WINGSDAY at Landshark’s with our delicious WINGS – crispy, juicy, & spicy to your satisfaction and only .59 Cents each ALL DAY LONG! Choose from among more than 20 sauces and rubs to compliment! SPORTS ON OUR ARMY OF BIG SCREENS – It’s THE NBA FINALS featuring Game Three action GOLDEN STATE WARRIORS vs CLEVELAND CAVALIERS! 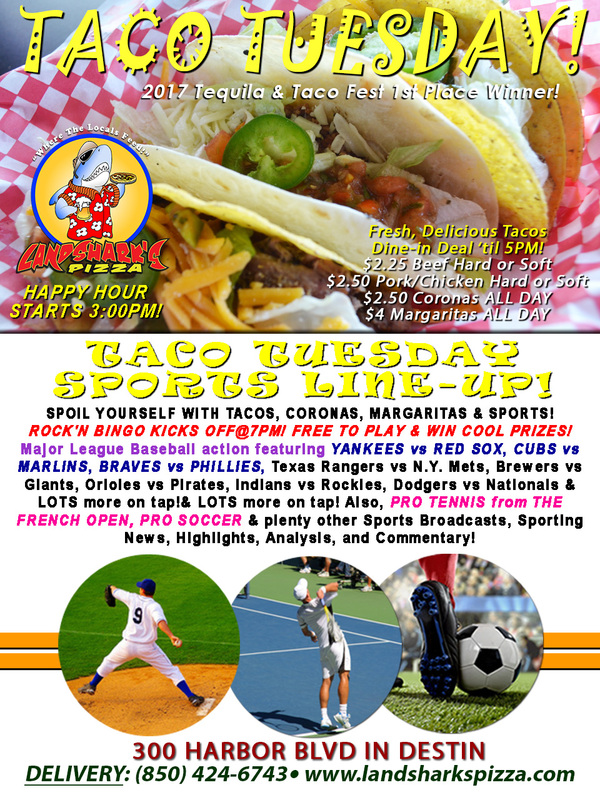 MAJOR LEAGUE BASEBALL featuring BRAVES vs PHILLIES, RAYS vs WHITE SOX, MARLINS vs CUBS, Diamondbacks vs Padres, Rangers vs Mets, Indians vs Rockies, Yankees vs Red Sox & LOTS more on tap! Also, PRO TENNIS from the prestigious FRENCH OPEN & PRO SOCCER plus plenty other Sports Broadcasts, Sporting News, Analysis, and Commentary! PGA Golf This Week: FedEx St. Jude Classic@TPC Southwind in Memphis $6.4 Million up for grabs. Pro Tennis This Week: The French Open continues thru Sunday Jun 11th! NASCAR This Week: Camping World Trucks Series Winstar Online Gaming 400@Texas Motor Speedway (Friday Jun 09th)|XFINITY Series Pocono Green 250@Pocono Raceway (Saturday Jun 10th)|Monster Energy Series Axalta Pocono 400@Pocono (Sunday Jun 11th). Previous Post: « TACO TUESDAY $2.25 Award-Winning Tacos & $2.50 Coronas $4 Margaritas & ROCK’N BINGO@7PM!